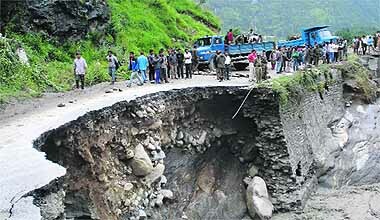 Seven persons were confirmed killed and 19 others feared dead, while nearly 250 houses collapsed in a cloudburst that hit the border district of Uttarkashi in the Garhwal hills of Uttarakhand late last night. A resident of this tourist town was killed in a cloudburst late on Friday night in the Seri Nullah and Beas Kund glacier upstream of Dhundi, about 25 km from here. Rowers Sandeep Kumar and Manjeet Singh finish second last in the men's double sculls event. 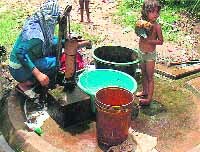 At least two blocks in the Gurdaspur district have shown the presence of arsenic in a study being carried out by expert committee commissioned by the Chief Minister, Prakash Singh Badal, in July. The content of �cancer causing element� has been found in excess to the WHO prescribed limits of 10 micrograms. Capping weeks of a high-pitch campaign against Chief Minister Narendra Modi, his predecessor Keshubhai Patel today quit the BJP and will announce a new political outfit tomorrow to challenge the Gujarat strongman in the December Assembly elections. A year after the Tri Valley university scam left several students from India high and dry, another American varsity with a significant Indian population, has run into trouble after its CEO was charged with visa fraud. Jerry Wang, 34, the CEO of Sunnyvale California-based Herguan University and the University of East-West Medicine, has been charged in a San Jose District Court with a 15-count indictment on visa fraud, including that he forged federal documents to allow foreign students to enter and stay in the US.